Your coffee table can have many uses — it rests your drinks (with coasters, of course), stores miscellaneous items, adds some style to your living room, and even serves as the center of a conversation area. Up until now, though, one thing it hasn’t been was a music visualizer. But thanks to this guide from Make: Magazine, you’ll soon be able to start a dance party on demand using your $10 jumbo-sized IKEA side table. 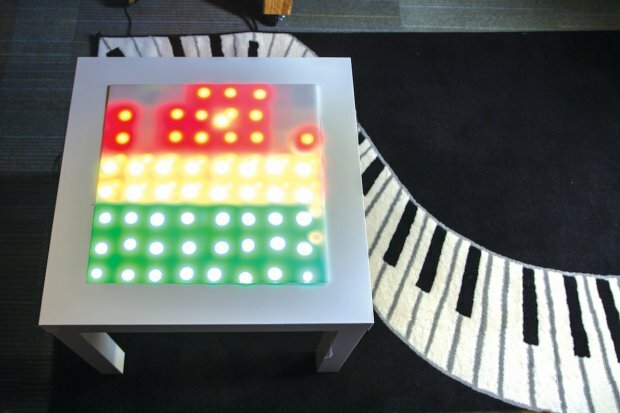 Aside from the inexpensive piece of furniture, the project calls for an LED matrix, tons of lights, a mic, some small electronic components, and an Arduino Uno for its brain. This allows its display to react and “dance” to the tunes coming from your speakers. Since it employs a minimal amount of current, the good news is that you’ll be able to run it off an iPhone charger or any other USB port that’s nearby. It’s based on the Tiny Music Visualizer project from Adafruit, using their I2C multiplexer board for a tiny 8×8 bicolor LED matrix. The Arduino code is from there, the circuit is from there — all I really created was a big handmade LED matrix, and put it into an IKEA table! Plug its USB cable into a phone charger or any USB port, then crank up the tunes and enjoy watching the giant tricolor pixels dance like splashing fountains of spectrum analyzer goodness! If you’re looking for an accessory that’ll be the light of your next shindig, head over to Make:’s full tutorial here.